Image caption Universal Credit remains reserved to Westminster, but Scottish ministers can introduce some "flexibilities"
The Scottish government plans use its new social security powers for the first time to increase the frequency of Universal Credit payments. 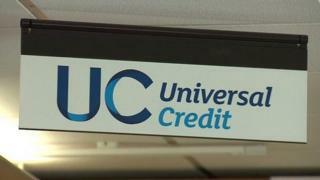 Universal Credit itself remains reserved, but ministers will use new powers to give claimants the option to be paid fortnightly instead of monthly. The government also plans to offer to pay housing benefits direct to landlords rather than via claimants. Opposition MSPs welcomed the move, but said the government should do more. Holyrood is taking on a series of newly-devolved welfare powers, from personal independence payments to carer's allowances. A new social security agency is being set up and a Social Security Bill is set to be introduced this year. The UK's Department of Work and Pensions (DWP) will retain overall control over Universal Credit, the single payment for working-age people introduced by the UK government. However, the Scottish government is to take on powers to introduce some flexibilities over payments. Ministers plan to use these powers to give new claimants in areas where a digital planning system has been set up the option of twice-monthly payments, instead of the current monthly system. Meanwhile, tenants will have the choice of having the housing element of their Universal Credit payment sent directly to their landlord. Social Security Minister Jeane Freeman said this option would be available to tenants in the private rented sector as well as those in social housing. She told the Good Morning Scotland programme that increasing the frequency of the payment was key to many claimants. She said: "When you're on a very tight budget as people on benefits are, then it is very hard to budget that amount over a whole month. "Knowing that a payment is coming to you, for the benefit that you are entitled to every fortnight, makes that budgeting exercise easier for those households and that means you can make better decisions and be more in control of your finances over those two-week periods." She denied that her government was not going far enough and insisted any Scottish government change to the Universal Credit was dependant on what the UK government's Department of Work and Pensions systems could cope with. In particular, she said ministers were working to change the current situation where a single benefit payment was made to a single person within a household after lobbying from women's groups. She added: "We're in discussions with DWP about how they can deliver that change for us. So I'd hope that that further change will be something that we'll be able to do in the near future." She also told the programme that a number of organisations had made the case for the Scottish government to top up the benefit. She said: "I completely understand and am sympathetic towards those claims, but I have to make the point that the UK government is cutting welfare spend by £2bn in Scotland by 2020. "We are currently spending £100m every single year to mitigate the worst affects of those benefits in a context where our overall Scottish budget has been cut by 9.2%." Ms Freeman said another consultation will be carried out in the coming weeks to gather views on the draft regulations. John Blackwood, chief executive of Scottish Association of Landlords, welcomed the option of direct payments to landlords. He said: "This should help protect tenancies and minimise rent arrears which will benefit both the tenant and the landlord. It is only fair that private sector tenants have the same option to choose direct payments as tenants in the social sector." However, Scottish Conservative MSP Annie Wells pointed to the fact the transition of some benefits could take until 2020 to complete, saying she wanted the Scottish government to use more of its powers. She said: "I welcome the fact the UK government has given the Scottish government these powers. However, the Scottish government has now shown that they'll only use a small portion of the powers devolved through the Scotland Act. I want to see them use more of the powers. "They've asked for a hold-off for three years to take all these powers on board. It's alright complaining and not governing, but we need to see them actually governing and using the powers they were given." Labour's Iain Gray welcomed the changes, but also highlighted that Westminster will continue to administer some devolved benefits for some time. He said: "While I welcome the intention to use this little bit of the welfare power which was devolved through Smith, we have this situation where the Scottish government have delayed taking on the powers over most benefits for three years, and we're not very sure about when the flexibility they've talked about is going to come in." Meanwhile, Scottish Greens social security spokeswoman Alison Johnstone said the rollout of Universal Credit was "clearly causing serious problems" in parts of Scotland. She said: "We look forward to seeing the Scottish government's plans for use of its 'new flexibilities' on Universal Credit in more detail because it's becoming increasingly clear that the DWP remains unlikely to improve how it operates. "The changes the Scottish government propose are welcome and will make life easier for people receiving Universal Credit. It's important we make the most of every power coming our way."